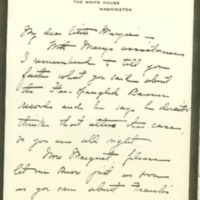 Helen Bones writes to Margaret about her upcoming visit to Jessie, and White House news. With Mary's assistance I remembered to tell your father what you said about the Star-Spangled Banner records and he says he doestn't think that alters the case, so you are all right. Now Margaret, please let me know just as soon as you can about Frank's return, for I do want my week with Jessie, or part week, as the case may be. Naturally, if Frank came back before I left the visit would not be spoiled, but I'd rather be with Jessie when she needs me, just as you didwould. And you know you must let me know in time to make connections with you, there. I'm so glad you had a chance to talk to Mr. Tumulty about White, for the former has the greatest admiration for you and has so much confidence in your judgment. I wish hope you touched on the receptions. I feel perfectly sure he is responsible; your father can't have thought of any but the political side of the matter and as you said yesterday, there will be more people shocked by the giving of them than those who will criticize them not bbeing given. It seems to me I can't bear to think of how certain people will regard it—perhaps the very people who would criticize the other way; but the criticism the other way wouldn't be an insult to Cousin Woodrow. I hope you can persuade him not to do it—you and Jessie and Nell. Bones, Helen Woodrow, “Helen Woodrow Bones to Margaret Axson Wilson,” 1914 November 3, WWP17503, Jessie Wilson Sayre Correspondence, Woodrow Wilson Presidential Library & Museum, Staunton, Virginia.